NYC Educator: Why Would a Teachers' Union Support Standardized Testing So Very Much? Why Would a Teachers' Union Support Standardized Testing So Very Much? Add my Union to the mix making that pledge! When my U.F.T. clings to annual standardized testing, it sends a clear message to me. My union believes that teachers--the very same people whose interests are the primary reason for its existence--lack the wherewithal to effectively evaluate students in their classrooms without the use of standardized tests. Our union seems to favor standardized tests, often created at great cost, over the judgment of teachers. At the same time, schools suffer overcrowding and under-funding, we line the pockets of Pearson and such. We deprive our students of the resources necessary to experience more meaningful, and certainly more memorable, learning experiences. When our Union feels that standardized tests, created far from the classroom, trump the year-long observations of teachers, we are in very serious trouble. Even if teachers were the ones to write new standardized tests, I would still say testing every year is too much. Our Union leadership is, itself, far removed from the classroom. It doesn't experience firsthand the valuable time wasted by test prep in young people's lives. It doesn't understand how much of the information crammed into unwilling heads will soon be forgotten. It never sees kids throwing up, losing all hope. It never sees kids banging their heads or just slowly lowering them in defeat. Leadership doesn't view with the same sense of disgust the sometimes shoddy, high-stakes test contents which teachers must swear not to divulge. Neither does it view the young students whose thirst for knowledge may forever be sapped or whose self image may forever be ruined. Failure! Failure! Failure! 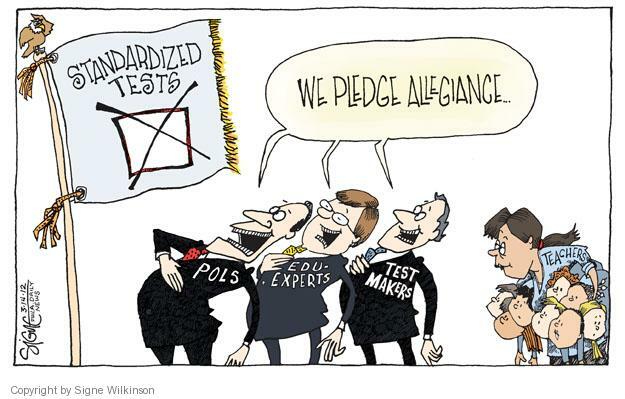 Just who is our Union defending when it defends yearly standardized tests and the Common Core? It doesn't seem to be defending students and it surely doesn't seem to be defending teachers!